Yep. Sometime in the next year or so. And the trans turned out to be ok. My axle nut backed out and the rotor was hitting the caliper bracket. It's close to begin with since I'm running 5.5 gen brakes on a re-drilled 4th gen knuckle. The nut is now locktited and locked with another nut. The cotter pin hole is like a half inch from the nut end. It was torqued to 210ft-lb and the range is 170-230. I re-torqued it to 220. Good for now till the next thing goes. The last 2 winters I just did the hella sunk thing. I've got a 22mm spacer on the rear now and I'll probably throw a 15-20 up front too. Those rims look great! What color did you use exactly? 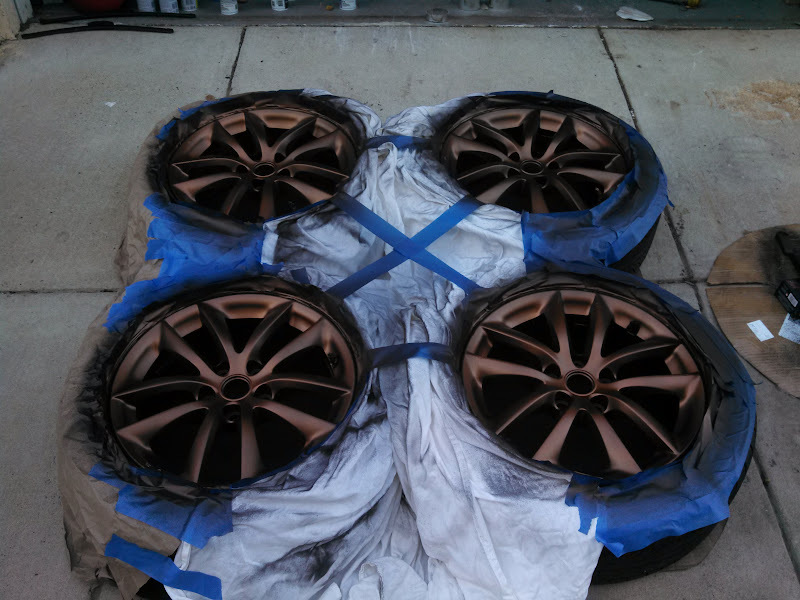 For all 4 wheels I used 4 cans of black as a base then 3 cans of the copper metalizer. Looks good! Definitely can tell a lot of work went into it looking at the then and now pics. Especially like the custom steering wheel, looks like it should have rolled off the factory floor with it. Threw 15mm spacers up front and I probably could have went with 20s. I may pick up a set of those if it bothers me enough. At just under 4k, the passenger side Tough One axle is starting to let go. Also after about 8k the Autopart International driver's side axle has a bit of play also. A Tough One driver's axle is going in since the TO outlasted the API I had on the passenger side, and put the Driveshaft Shop rebuilt OEM axle in on the passenger side. I still need to put a good center bearing in on the DSS axle though. 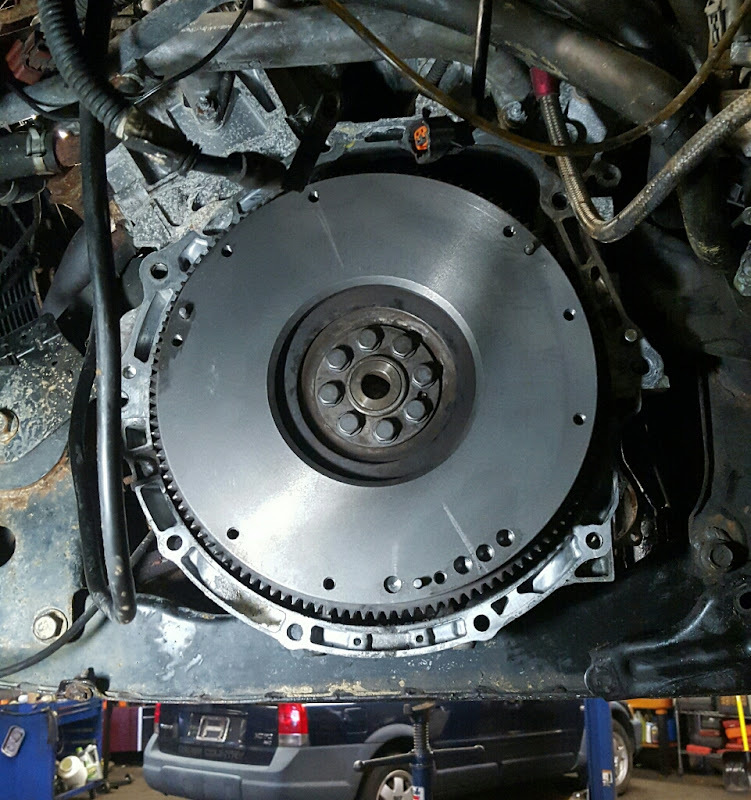 Along with that, I'm putting in a Southbend Stage 1 clutch, new friction plate on the flywheel (it's 2-pc), and axle seals for good measure. When I found out my 00-01 oem replacement clutch was slipping at the track last season the plan was to upgrade when the axle(s) failed.. Well here we are. I'll be throwing all that in this week. The goal is a 13.0 on DRs and a 12.8/9 if I decided to go slicks. My traps and previous non-clutch slip #s point in this direction So we'll see. I almost got finished with the car today but not quite. 5 o' clock felt like it came a bit too early and it was time for my buddies to close up shop and go home. I still have maybe 1.5-2 hours worth of work. 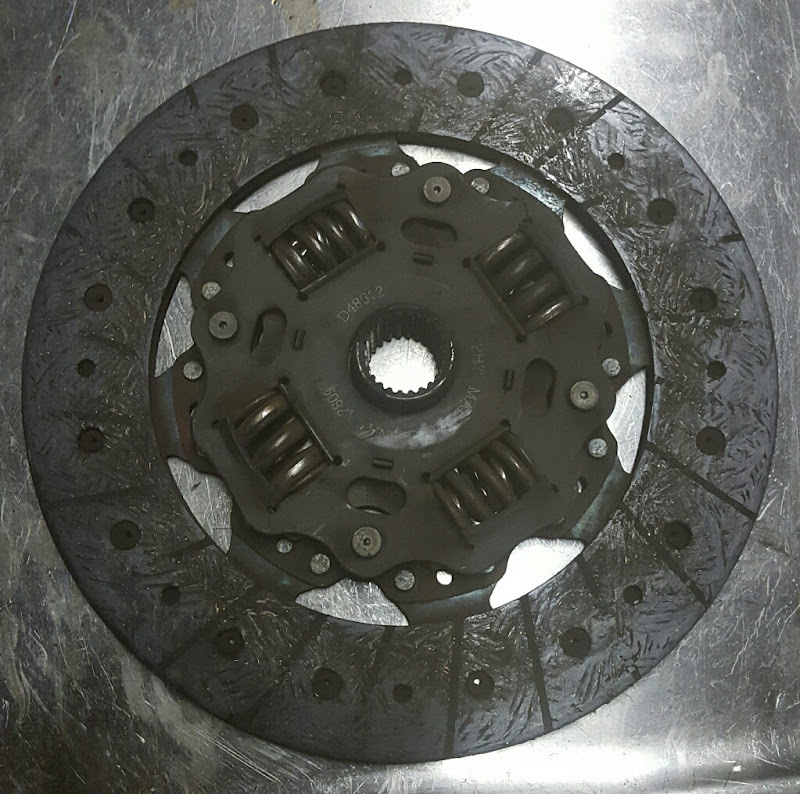 My previous friction plate on the flywheel had a healthy glaze and the pressure plate had cracks near three of the springs and 2 broken inner springs.. lol. I guess it doesn't owe me anything after 5 years, 45k, 1/3 more hp, and 25ish track passes. New friction disc on the flywheel and Southbend Stage 1 clutch. Pressed out center bearing from passenger axle I drove to the shop on then replaced the DSS axle one. PITA that was. Sanded the engine and transmission mating surfaces and dielectric greased them to improve aluminum grounding contact. This may sound strange but before I started doing this, I would have starter issues no matter how many ground cables I ran. If I remember.. I want to see if my 15" BBSes are even close to fitting over my current brakes. 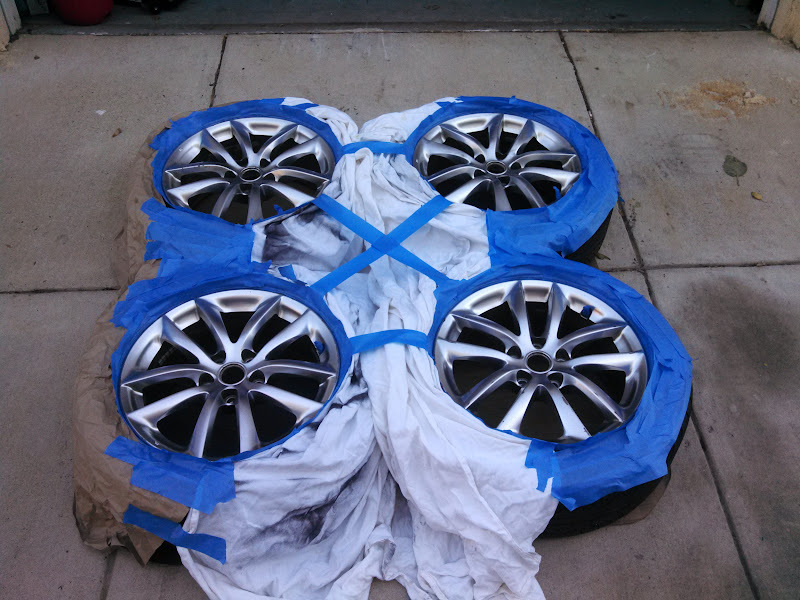 If they do, I might do a track wheel setup with those. I'll be headed back Friday to finish up. I'm a little anxious to see how the new clutch and axles feel. Nice Mike. 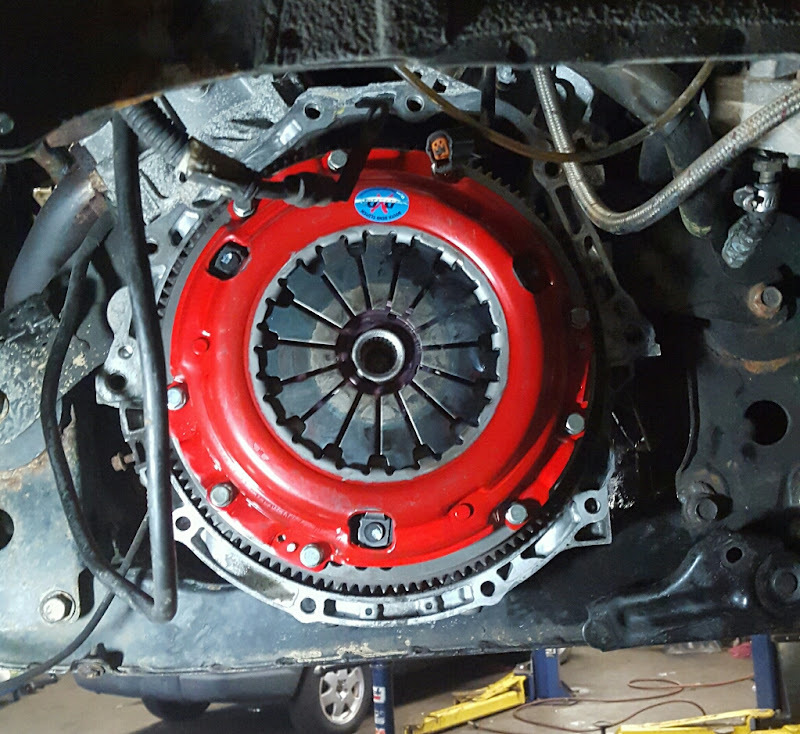 I know SBC is always been a solid choice with the Diesel guys, if they can build a clutch to hold up with that stress, your car should be no sweat! Yep I was going on that and a few Maxima guys have had success with them. I got it all back together this morning. Anddd. This car hates me. After about 15 miles, I've got a low speed noise coming from the passenger front wheel well. At this point, I'm thinking either jack shaft bearing.. which makes no sense because it's the same as the last passenger axle that was in the car, or somehow the wheel bearing. Threw another Advance axle in there and the noise is gone. Also I did test fit the 15s. I'm pretty sure they would fit with a 5mm spacer. The studs protruding through the 15mm spacers I have on there hit the back of the wheel. No spacer and the wheel makes contact with the caliper but not by much. 11.6 rotors and 15s would be pretty good. My driver's side door panel has been really showing the 220k miles for the past couple years. About 6 months ago it started to tear ontop of looking generally beat. I've been hawking ebay for the right color for the better part of 2 years and most of what I would find wasn't in much better shape than what I have. Well, somehow I was able to pick this one up for $50 shipped. Killer deal considering the light color and that they haven't made the car in 17 years. The only thing it was missing was a hole for the tweeter grill. No biggie. Best $50 I've spent on this car in a while. I'm hoping to get this car to the track sometime in the next few weeks. Non-slipping clutch - replaced earlier this year and broken in. 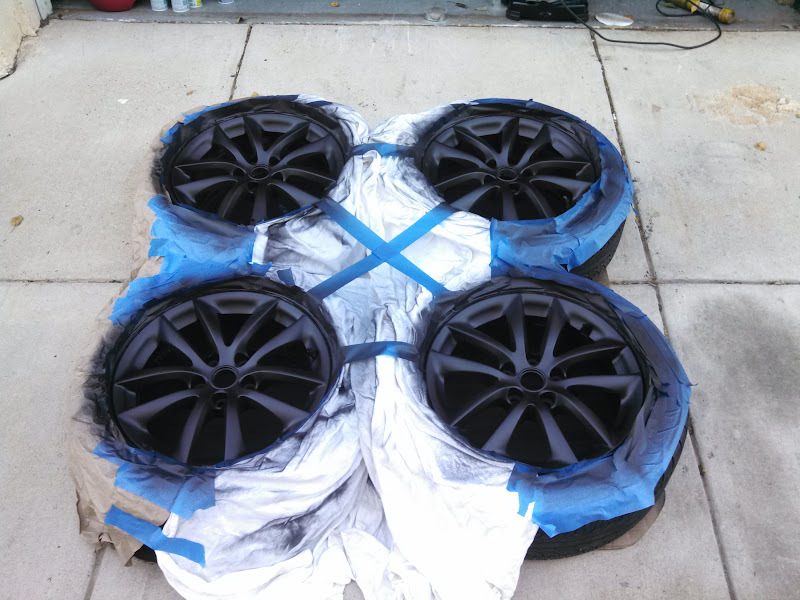 Light 15s in the rear vs. heavy 18x9s. All things equal, If I get a 2.0 60' again I should be low low 13s. We shall see..
Good luck! Sounds like it'll be a fun time. I got done everything I wanted to..
New spark plugs are in. I picked up my 15s from my buddy's shop. My WBO2 is relocated up pre-catback flange. I was going to make a bracket to unbolt the exhaust and offset it for track runs but there wasn't enough room.. Instead I dug through my buddy's exhaust pile to find parts to make a manual cut out in the Y. I found a 3" flange from a stock cat, and a 3" outlet on some aftermarket exhaust. Parts I hacked up are below.. For whatever reason, after I welded the flange to the 3" pipe, my welds went to crap. I mean, they work but they were bad enough I didn't even want to even take a picture. Prep was good, ground was good, gas was good, wire speed and heat tested ok on spare piece. Whatever. Either way I can just take a long extension and unbolt the plate I made to run an open Y. It's sooooooooooooooooo loud.. Especially with launch control. Got to the track last night and it was disappointing.. It was crazy packed and I only got 3 passes in from 6-10:30. The 1st run my launch control setting from last time was too high and I spun through 1st. Last run I upped the launch and it bogged even worse and I missed 3rd. And now I'm reminded why I only go once a year. hour+ waits and not getting anything dialed in for a clean pass. I took another look at my logs from the track and my TPS did vary in the waterbox and rolling up to the line but was at around 10% during the two runs I logged.. The TPS is original to the car at 220k so I figured I would replace it just for that fact. 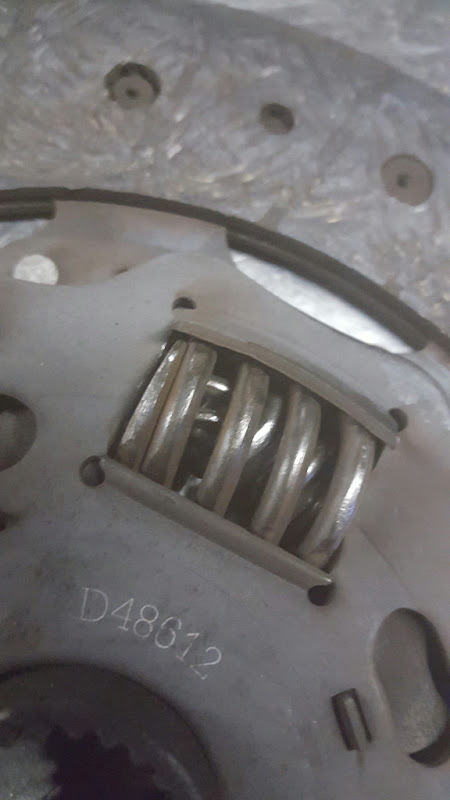 When I took apart my DBW throttle body that I converted to drive by cable, I also saw just how much material the TPS rotating tab had to bite onto.. not much. It's possible that the tab slipped out of place during the runs. I pulled the material the tab rides in out a bit for much more contact when the new TPS went in. That should be good to go now. When you think about it, it's kind of wild I ran a 13.8 with my ECU thinking I was at 10% TPS. I decided to drive down to Cecil County Dragway (MD) and give the i30 another shot. The good news is the lines were short or non existent and I squeeked in a PB. One tenth faster than my previous. 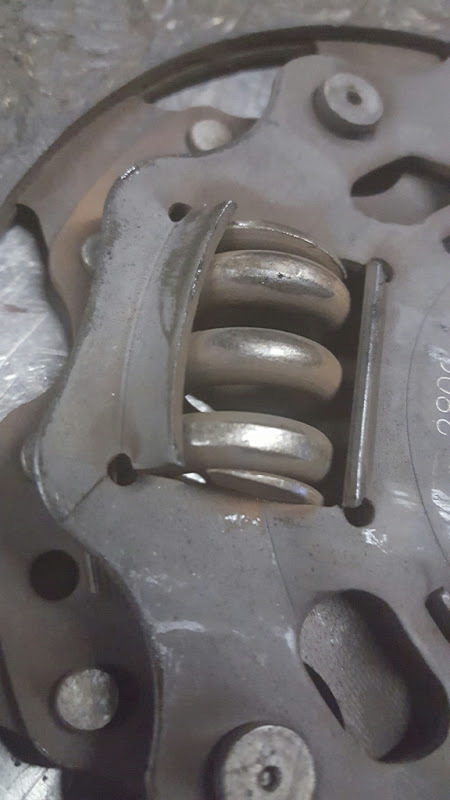 The bad news is I know I had at least 2 more tenths in the tune and 60' but my 1000 mile Southbend Clutch started slipping after the first few runs. I guess it can't hang with shifts over 7k. I was pretty pissed a couple weeks ago with that 13.8. This time I can't say I'm thrilled with the final numbers but I'm definitely not mad about it. The reason I say I have more in the 60 is because a 2.0 is b.s. with drag radials. The reason I say I have more in the tune is my fuel cut off/rev limiter wasn't dialed in during that 13.3 run and I bounced the stock limiter slightly going into 3rd and again but worse and right before the finish. I got that dialed in but at the same time the clutch started to go. So do I really want to put in another clutch and pick up a set of slicks for 12s? At the moment I really do not.. But, who knows. Last edited by 95naSTA on Thu Jun 30, 2016 2:11 pm, edited 1 time in total. 13.3 is hauling though, for what that car is. I'd be pretty satisfied. Who knows, maybe after some more tinkering you'll get your 12.99! 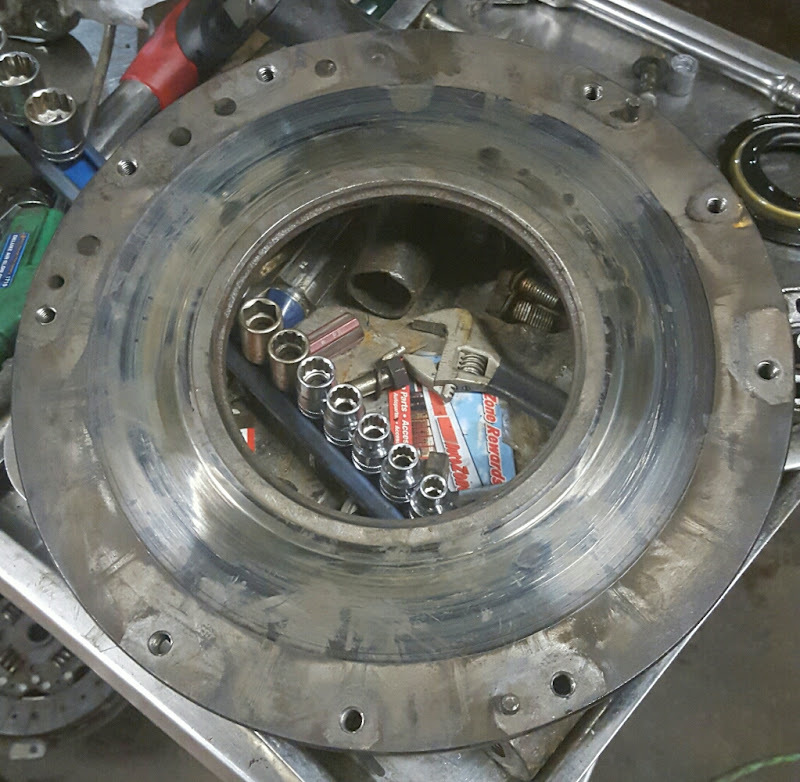 So, almost a year to the day I posted putting a Southbend clutch in, I have to replace it. It developed a high rpm slip at the track a few posts up then today I was pulling away from a stoplight and it made a bunch of really crappy speed and clutch pedal dependent noises. Considering the noise goes away when the clutch pedal in, I think the TO bearing crapped itself. I sorted through about 15 years or maxima.org threads on ACT, Exedy, Spec, Clutchmasters, and other clutches to find out who put the most abuse on which at the track with success. I settled on a full disc ACT clutch that is rated at 445 ft-lbs. The Southbend it's replacing was rated at 300 ft-lbs. I should be around 260ish ft-lbs at the wheels, max. Which is why that 300 SB ft-lb rating (plus good rep with 350z folks) had me thinking I was in the green. Since I'm upgrading the clutch, I'll most likely track it again.. hopefully with slicks. Unless something else blows up. I would love a 13.0 but I would never want to track it again at a 12.99. If I hook and nothing slips or explodes I'm right there.